Foam Cakes (little or no fat) and Shortened (butter) Cakes. Cakes that contain little or no fat, such as Sponge, Angel Food and Chiffon Cakes, are often referred to as Foam cakes. These have a larger proportion of egg than butter cakes. Butter cakes, also called shortened cakes or creamed cakes, contain butter, margarine or vegetable shortening, which contribute to a finely textured, tender and moist cake. Both Foam and Butter Cakes lend themselves to limitless variations, depending on the flavorings added to the basic ingredients, the shapes of the pans used in baking, and fillings, icings and decorations used. Strictly speaking, a foam cake contains no leavening or fat other than provided by the eggs; baking powder and baking soda are not necessary in these recipes. As a result, it is important to preheat the oven and have the baking pans ready in advance. These cakes need to be baked as soon as they are ready or the egg whites will deflate; they will do so after about 5 minutes of sitting on the countertop. Because Foam Cakes are so light and airy, they should be cut with a serrated knife in a sawing motion to cut. An electric knife is helpful, too. There are some similarities and differences within Foam Cakes. Another variation of the foam cake is the Flourless Chocolate Cake, a very rich cake leavened with eggs. Its richness comes from chocolate, egg yolks and some type of fat, usually butter. The Biscuit is where the eggs are separated and the yolks whipped with sugar until pale yellow while the whites are whisked with a little sugar until voluminous. Then the two are folded together with a bit of flour to bind them and, if desired, melted butter and or a flavoring like vanilla are added last. In a Genoise the eggs are beaten whole, never separated with the sugar, until they are mousse-like and very pale yellow. Last, the flour is folded in as well as vegetable oil or clarified butter for moistness. The butter makes a moister, more tender and flavorful cake. Chiffon cakes are light like sponge cakes, but are easier to make because there are no egg whites to beat and fold in. Plus, there's more fat in it (oil) so it's more tender and moist than sponge cake. Angel Food Cakes have no added leavening (such as baking powder), shortening or egg yolks. They are leavened with beaten egg whites and they have a high proportion of egg whites to flour. Angel food cakes make a fabulous no-fat treat. These molded desserts are a variation of the cake in which fillings, hot or cold, are poured into a bowl lined with bread, ladyfingers or pieces of cake, then decorated. A French pastry chef invented the charlotte in the 1800's. The classic version is the Charlotte Russe. Also try such flavors as chocolate, eggnog, strawberry, Bavarian cream. Made from beaten egg whites and sugar, meringue is used as a leavening agent in some cake batters or to lighten a souffle or mousse. Baked by themselves into rings or other shapes, meringues make for light and pretty cakes filled with fruit or ice cream. They can be family size or baked as individual servings. A common name for a meringue cake is Pavlova. These are a form of sponge-cake, baked in a shallow pan and used for jellyrolls or such holiday cakes as the Christmas "yule log," an especially nice variation. The cake (jelly roll, swiss roll, roulade) are immediately removed from the pan and rolled up in a sugared tea towel after baking. When cool, they are unrolled gently, filled with jelly, custard or icings and rerolled. For the yule log (Buche de Noel), fill and ice with chocolate buttercream, then decorate with leaves, "branches," meringue mushrooms and woodland animals - a crowd-pleaser! Cake baking is pretty straightforward, but perhaps you'll learn something or refresh your memory from reading these tips. If you are going to the trouble to make a "from scratch" cake, begin with top-quality ingredients, resisting temptations to substitute. Measure ingredients carefully, using spoons and measuring cups made especially for this purpose. All measurements are usually level. We all have memories of Grandma's baking, a handful of this and a shake of that, but remember, she baked everything from scratch and had years of experience. All-purpose flour usually doesn't need to be sifted; simply stir it lightly with a spoon before measuring. When sifted flour is called for, the ingredients list will say "1 cup sifted flour." This means sift the flour and then measure. If it says, "1 cup flour, sifted," the flour should be measured and then sifted. CAKE FLOUR, which has been finely milled, has a tendency to form lumps. It should always be sifted before using. Make sure you have all the ingredients before you start making the batter. Use the pan sizes suggested and prepare the baking pans carefully as the recipe states. If you are greasing the pans, solid vegetable shortening is best to use. If the directions call for a lined pan, cut parchment or waxed paper to fit the bottom of the pan, then grease the pan before and after placing the paper inside. Some recipes call for dusting the pans with flour. This helps the cake develop a thin, crisp crust and prevents the cake from absorbing the fat used to grease the pan. Use about one tablespoon all-purpose flour for dusting each pan, shaking and tilting until the bottom and sides have a fine coating. Then hold the pan upside down over the sink and tap it gently so excess flour falls away. PREHEATING OVEN, OVEN THERMOMETERS, ETC. It is important to have your oven preheated so you can immediately put the pans into the hot oven. Invest in an oven thermometer so you'll get accurate temperatures. Cake batter should not sit before baking, because chemical leaveners begin working as soon as they are mixed with liquids and the air in foam batters will begin to dissipate. Place the pan on the oven's center rack. If two or more pans are used, allow at least an inch of space between the pans and two inches between the pans and the walls of the oven for proper heat circulation. DO NOT OPEN THE OVEN during the first half of the baking time. Cold air will interfere with the cake's rising. 3). Use dental floss, held very taut (this works best for cheesecake). If the crust of a cake layer seems tough or if the layer has an uneven top, trim it away with a serrated knife before frosting. To prevent the cut surface from shedding crumbs and spoiling the frosting, spread it with a thin layer of frosting (called the crumb layer) before applying the final frosting. To keep a serving plate clean while frosting a cake, place strips of waxed paper 4 inches wide in a square to cover the edges of the plate. Center the cake on the plate, making sure the strips are positioned to cover the plate on all sides. Frost the cake and then carefully pull away the strips. This rich, light cake is made with flour, sugar, eggs, butter and vanilla. It's similar in texture to a moist SPONGE CAKE. It was developed in Genoa, Italy, adapted by the French and is now baked by gourmet cooks throughout Europe and the United States. Génoise is an extremely versatile cake and is used for many elegant presentations such as PETITS FOURS, cake rolls and BAKED ALASKA. The flavor and life of a Genoise cake comes to life only with the right amount of syrup, and they don't disintegrate when moistened with flavored syrup which adds moisture. Too little the cake seems dry; too much the cake becomes too heavy. The perfect amount of syrup to use is 3 to 4 tablespoons for every egg used in the recipe. If the cake is several days old and dry, add an extra tablespoon. Simple Syrup is a basic pastry-making staple; it is a 30° Baume sugar solution, which is composed of roughly 4 parts sugar, 3 parts water by weight (closer: 1350 to 1000, e.g. 1350 grams sugar added to 1 liter water). While it occasionally appears in other contexts, usually simple syrup is flavored with some kind of liqueur, and used to moisten cake, particularly genoise. Traditional proportions range from 1 part liqueur to 3 parts syrup to 1 part liqueur to 4 parts syrup. In practice, the following Recipe will make enough to flavor up to a 10-egg Genoise ( two 9-inch round layers). 3. 2 Tbsp. up to 1/4 cup (4 Tbsp.) of appropriate liqueur, varied according to context, taste, and your preference. Bring the sugar and water to a boil in a covered pot. When all the sugar crystals have dissolved, let cool. Add the liqueur. If applying to genoise, brush it on, preferably on a freshly cut surface (e.g. if you have split layers). You can drizzle or smear it on with a spoon, but brushing really does work better. 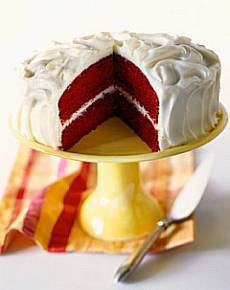 You may want the cake to rest a few minutes, perhaps chill a bit, before filling or icing recently brushed layers. A simple syrup used for many types of cakes. Makes about 1 1/4 cups. In a small pot, bring to a boil 1/4 cup water, set over high heat. Add in the sugar and boil until the sugar has dissolved, stirring occasionally. Remove from heat and add in 1/2 cup cold water; stir to combine. Add in the lemon juice and vanilla: cool. You can also use, instead of vanilla: Kirsch, orange liqueur, brandy, strong brewed coffee, rum, almond, or any favorite extract, to flavor the syrup. A simple syrup used for many types of cakes. Makes about 1 1/3 cups. In a small pot, combine: sugar and 1/2 cup water; bring to a boil, set over high heat. Let mixture boil for 30 seconds and then transfer to a 2 cup measuring cup. Add in the 3/4 cups cold water, lemon juice and orange extract: stir. Cool before using; can be refrigerated. A simple syrup used for many types of cakes. Makes about 1 1/2 cups. In a small pot, combine: sugar and 1/4 cup water; bring to a boil, set over high heat. Let mixture boil for 30 seconds and then transfer to a 2 cup measuring cup. Add in the 1/2 cup cold water, lemon juice and vanilla extract: stir. Cool before using; can be refrigerated. This tip suggests using dental floss to cut a cake into two even layers. Once the cake is divided - professional bakers call this process "torting" - the layers can be filled with jam, buttercream, or whipped cream. 1. Place several toothpicks around the edge of the cake, halfway between the top and the bottom. Use a ruler to determine the midpoint, thus ensuring even layers. 2. Wrap a long piece of waxed dental floss around the circumference of the cake, making sure that the floss rests directly on top of the toothpicks. Cross ends of floss and pull. As floss tightens, it will cut through the cake. 3. Once floss has cut through the cake, lift top layer and set aside. Remove toothpicks from bottom layer and proceed with filling and decorating the cake. Just before the cake is through baking, place a folded bathroom towel in the sink and saturate it with steaming hot water. When the cake comes out of the oven, immediately set the it on top of the towel, pan side down, and leave it for ten seconds. Immediately invert the cake onto a cooling rack. The cake will come out clean and whole without sticking. Professionally decorated cakes always seem to have a molten, silky look. To get that same appearance in your homemade cakes, frost the sides and top of the cake and smooth out with a spatula as usual. Use a hair dryer to "blow-dry" the frosted surfaces of the cake. The slight melting of the frosting gives it that smooth, lustrous appearance. 1). Overbeating – too much air is incorporated into batter. 2). Underbaking - Oven temperature too low and/or too short a baking time. 3). Over or under measurement of liquid or under measurement of flour. 4). Using too small or large of a baking pan. 5). Moving or jarring cake before sufficiently baked or opening the oven door before cake sets. Note: Only open oven door if absolutely needed, one-half to three-quarter's way through baking. 6). The most common error has to do with the oven temperature. Make sure you have an oven thermometer to test your oven for accuracy. 7). Depending on the recipe if you fold in egg whites, if not beaten fully or folded in too harshly, the cake could fall. 8). Even creaming the butter and sugar too much or too little can cause problems. Fresh edible flowers make gorgeous and oh-so-easy cake decorations. You can start with a frosted cake or even just a plain cake (it's nice lightly dusted with confectioners' sugar) then pile on the flowers such as sweet violets, lavender, honeysuckle, rose petals, borage, bachelor's buttons, johnny-jump ups, and calendulas just to name a few. For an added touch, dusting the flowers with super fine sugar gives a wonderful sparkly glow to your creation. Readily available candied violets and candied rose petals also add that special touch to a decorated cake. Just be sure when using flowers as a decoration that they are clean, all the parts you are using are non-toxic, and that they are pesticide free. Another great way to spice up a cake is with fresh fruit. Fresh berries can be piled on top of cake, sprinkled with confectioners' sugar and garnished with a few fresh mint leaves. Whole strawberries placed around the outside of a chocolate cake add a touch of color. Kiwis, grapes, orange sections, and strawberries can be arranged on the top of a cake and glazed with a shiny syrup. Fresh sliced figs with dollops of whipped cream can also be arranged decoratively on the top of a cake. These are just a few of the many ways fruit can be used in decorating cakes. Using caramel dipped, sugar-dusted, or candied fruit and/or rinds can also add a nice finishing touch to a beautiful cake. Confectioners' sugar or cocoa powder lightly dusted over the tops of cakes makes a nice finishing touch. Lace paper doilies placed over the cake before dusting makes wonderful lacy patterns, or create your own stencils using parchment paper cut into lovely designs such as stars, polka dots, flowers, diamonds, vines, and waves. Another great way to dust a cake is to use a stencil of radiating lines and both confectioners' sugar and cocoa powder. Place the stencil on top of the cake and dust with cocoa powder. Carefully remove the stencil and wipe off any remaining cocoa powder. Be very careful not to disturb the cocoa powder, and place the stencil on top of the cake again, this time making sure that the openings are on the parts of the cake that have not been dusted with cocoa powder. Dust with confectioners' sugar, carefully remove the stencil and voila! -- you'll get a very graphic two-toned design. Chocolate curls, ruffles, jagged slabs, and leaves are another easy way to jazz up a cake. Chocolate curls can be made with a vegetable peeler by simply shaving off pieces of a chocolate block. To get small flakes and curls make sure the chocolate block is cold, to get larger curls the surface of the chocolate should be slightly warm but not melted. To get even larger curls spread melted chocolate, in a thin layer, over a marble slab or a baking sheet, let the chocolate cool then scrape using a knife, spoon, or spatula depending on the size and the shape of the curl/ruffle you want. For jagged slabs of chocolate simply cut out irregular shapes with a knife or other sharp instrument. To make chocolate leaves carefully brush melted chocolate onto the underside of a non-toxic leaf, cool until chocolate has fully hardened, and gently peel off the natural leaf from the chocolate one. These chocolate confections can be piled high, lightly scattered, or precisely placed on a cake. A mixture of white and dark chocolate leaves gives a real dramatic flourish to a simple chocolate cake or even a decadent cheesecake. Marzipan molded into different shapes makes very attractive garnishes. Marzipan can be shaped into animals, fruits, vegetables, flowers, and any numerous fanciful shapes. It can be colored with paste food coloring before shaping for deeper more intense shades or dry food coloring can be dusted on the finished shapes for a subtle blush of color. Once made, these shapes arranged in groups or singly on or around a lightly frosted cake will make a very attractive or whimsical statement. When you go to the trouble to make a homemade cake, making sure the cake is done is an important process. No one wants a cake that is either still raw in the middle, or dryer than day old bread. There is no one hard and fast rule for making sure that a cake is done in terms of cooking temperatures and times. Each cake will bake slightly different according to its ingredients, the oven you are using, and the size of the baking pan or dish. Generally, one tests a cake by inserting a clean toothpick into the middle of the cake. If the toothpick comes out clean, the cake is done. If the toothpick comes out with crumbs, or clearly shows wet cake batter, the cake is not finished cooking. Don’t use a knife to test the cake as this can deflate a cake. If you don’t have a toothpick, you can substitute with a thin wooden skewer or an uncooked spaghetti noodle. Usually, the best way to ensure a cake is done is to rigidly follow the recipe ingredients. Substitutions like honey for sugar, or additions of wet ingredients like blueberries or bananas may result in a longer cooking time. In these cases, you can cook the cake until the time designated by the recipe and then test it, but you may need to add a little cooking time before the cake is done. Larger cakes usually require longer cooking at a slightly lower temperature. You may want to check the directions for baking doubled or tripled recipes. There are often different cooking times for people who live in mountainous regions, and be certain also to check if you are using a convection oven, as these usually have much quicker cooking times. When one purchases a convection oven, it will also usually come with a book of recipes, or modifications that can help you determine when your cake is done. One can also purchase cookbooks designed for the convection oven, which are likely to yield better results than recipes designed for traditional gas or electric ovens. Some cooks swear by the careful hand test to assess when a cake is done. They gently press on the top of the cake with the hand. If it feels firm, and does not give under the pressure, then the cake is done. It should spring back. The cake should only be pressed very lightly, or it can deflate the cake. Any significant amount of give suggests cooking the cake for longer. This method should be done carefully and quickly, since the cake will be quite hot. To make sure your cake is done properly, you might also want to hang an oven thermometer in your oven and test the temperature. Slight variations in oven temperature can change cooking time. As well, older ovens may have hot spots that can affect larger cakes particularly. If you know of such hot spots, be sure to keep the cake away from them, or directly centered on them when possible, so the cake cooks through evenly. Lastly, a good look at a cake, particularly those that are yellow or white can yield a lot of information about whether the cake is done. They tend to shrink from the sides as they become more cooked, though this is not usually the case with chocolate cakes, unless they contain a lot of butter. If the top seems to be getting golden or yellow, the cake is probably close to ready. If the cake still seems very pale, it may benefit from a few more minutes in the oven.